ARLINGTON, Va. Defense Advanced Research Projects Agency (DARPA) officials will host a competitors day on September 27, 2018, to communicate the vision and timeline of the DARPA Subterranean (SubT) Challenge, engage potential competitors, and provide a space for technical and operational exchange. The competitors day also will provide preliminary information about the SubT Challenge and encourage and promote the formation of cross-cutting teams possessing exceptional expertise and development capabilities for executing research and development capable of completing the DARPA SubT Challenge. The goal of the DARPA Subterranean Challenge is to discover innovative solutions to rapidly and remotely map, navigate, and search complex underground environments, including human-made tunnel systems, urban and municipal underground infrastructure, and natural cave networks. Teams will compete in three preliminary circuit events and the final event in both systems and virtual competitions. Each circuit event will explore the difficulties of operating in a specific underground environment as teams compete for monetary prizes. The first will focus on human-made tunnel systems. The second will focus on underground urban environments such as mass transit and municipal infrastructure. The third will focus on naturally occurring cave networks. The final event, planned for 2021, will put teams to the test with a course that incorporates diverse challenges from all three environments. The winner of the systems competition will take home a $2 million prize, while the winner of the virtual competition will earn a $750,000 prize. 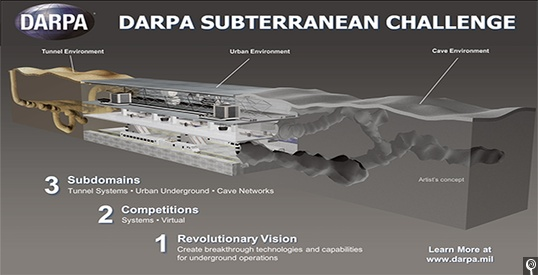 For additional information on the DARPA Subterranean Challenge please visit www.subtchallenge.com. The competitors day will be held Louisville, Kentucky. Registration will open August 15. Event details can be found in the Federal Business Opportunities website. Advance registration is required, and will close at noon EDT September 13 for on-site attendance and noon EDT September 19 for virtual attendance, or until capacity is reached.